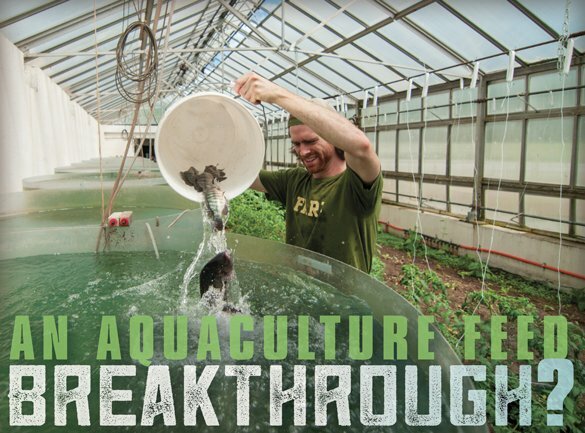 Home / Education / East / Dartmouth College / A breakthrough in fish-free aquaculture feed? cientists at Dartmouth College, in Hanover, New Hampshire, have discovered that marine microalgae can completely replace the wild fish oil currently used to feed tilapia, the second most farmed fish in the world and the most widely farmed in the United States. The findings, which appear in the open-access journal PLOS ONE, are being considered a breakthrough in the quest to develop sustainable, fish-free feeds for aquaculture, the world’s fastest growing food sector. The Dartmouth study is the first report of a marine microalgae species being successfully used as a complete replacement of fish oil in feed for Nile tilapia, which thrived on the new diet and bulked up despite eating less. Aquaculture currently uses more than 80 percent of the world’s fish oil and fishmeal, which are extracted from small ocean-caught fish, leading to over-fishing of these species. Pallab Sarker, the new study’s lead author, previously found that salmon aquaculture consumes more wild fish – in the form of protein and oil from open-ocean fishes like mackerel, herring, anchovies and menhaden – than it produces in the form of edible meat from farmed fish, resulting in a net removal of fish on a global basis. Scientists have reported success in partially or totally replacing fish oil with vegetable oil in many farmed-fish species, but studies show that vegetable oil reduces the nutritional quality of the fish flesh. In contrast to vegetable oil, microalgae are much higher in essential omega-3 fatty acids, which are important for maintaining fish health and imparting neurological, cardiovascular and anti-cancer benefits to humans. In their new study, the Dartmouth researchers looked at juvenile Nile tilapia, a species naturally evolved to eat microalgae as part of its diet. The team conducted a feeding experiment with dried Schizochytrium, a species of marine microalgae rich in health-promoting omega-3 fatty acids. Their goal was to determine the optimum level of fish-oil substitution (partial or complete) for good growth of tilapia. When the researchers fully replaced fish oil with the microalgae, they found significantly higher weight gain and better food conversion compared to a control diet containing fish oil, and no significant change in survival and growth rates among all diets. The fish-oil-free microalgae diet also had the highest content of omega-3 fatty acids in tilapia fillets. “Our study shows that Schizochytrium is a high quality candidate for complete substitution of fish oil in juvenile Nile tilapia feeds, providing an innovative means to formulate and optimize the composition of feed while simultaneously raising feed efficiency of tilapia aquaculture,” says Dr. Sarker, a research assistant professor in Dartmouth’s Environmental Studies Program. Co-author Anne Kapuscinski, a professor of sustainability science, says the results also point to the possibility of formulating ecologically and socially sustainable aquafeeds, with greatly reduced or no fish oil from marine fisheries and without having to switch to vegetable oils from industrially farmed crops. Commercial realization of this potential will require advances in strategies to reduce non-renewable inputs, such as inorganic fertilizers and fossil fuels, and monetary costs of large-scale production of marine microalgae, she says. “Feed manufacturers can explore this approach to develop aquafeeds for aquaculturists aiming to cater to the consumer willing to pay a premium for health enhanced foods,” Kapuscinski says. The Dartmouth researchers are conducting similar studies in rainbow trout, which they are using as a model species for salmon farming. Dartmouth’s Team Integrated Food Energy Systems, founded by Dr. Kapuscinski, pursues interdisciplinary research on the global emergence of integrated food-energy systems and their capacity to solve problems at the food-water-energy-climate nexus.